Posted February 11, 2015 by Sage & filed under Coaching, Training and Racing, Yoga. It was, as ever, a treat to present at the Running Summit in Morristown, NJ, last weekend. The presentations, participants, and facility are all top-notch. 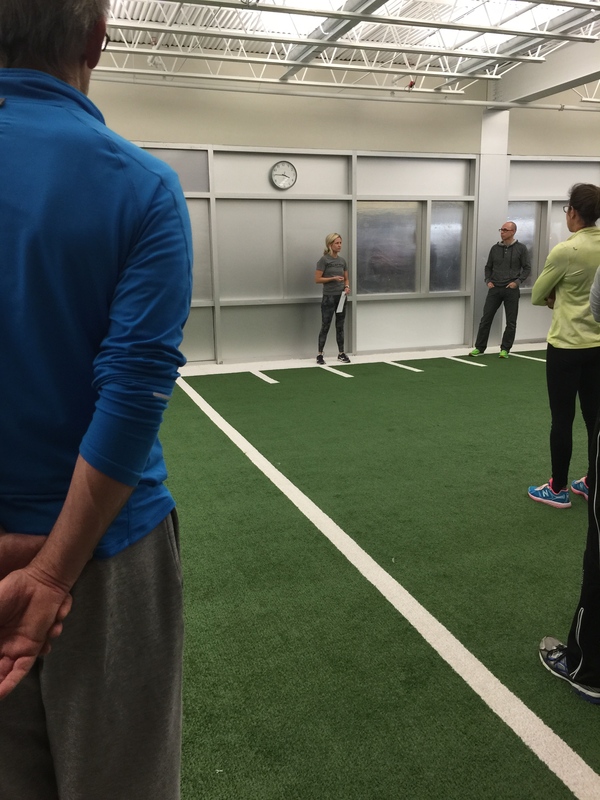 (At right is Wendy presenting on running form analysis. If you are in New York City, you should definitely schedule a custom running analysis session with Wendy at NY Custom PT!) I spoke on race plans and execution (the subject of my book Racing Wisely) and led a fun session on core strength. After a day of sitting, I know it felt good! As promised, here are my notes for those of you who attended (and those who are interested). The alternative title for the presentation was “Beyond Planks and Crunches.” We focused on ways to create and progress core-strength routines for ourselves and our athletes that target the needs of the runner. Specifically, we worked to release the front of the body—an area that grows tight as we spend most of our day sitting—and then to strengthen the back of the body. Without first stretching the front, strengthening the back is ineffective, as you’d be constantly butting up against the limitations of tightness. To that end, we started with some yoga-derived stretches. Rest on your belly. This stretches the chest, hip flexors, and ankles. Take several breaths in sphinx pose. While you have your chest propped, you can drop your chin to your chest to stretch the back of your neck. Hike one knee up, and add a side bend to look toward it. Finally, twist toward it as you spin your chest to the ceiling. Finish with some cat/cow stretches: exhale and round your back like a cat; inhale and lift your tailbone and your gaze while you arch your back. Read more about this sequence in this post at my Yoga Journal blog. Find mountain pose, the basis of good running form. Lift your arms, then your heels, keeping good alignment. To add, bend your knees either a little or a lot! Lift and lower one leg at a time. Lift one leg and pulse it higher. Lift one leg and draw circles with it in both directions. Locust pose is spinal extension work—and it’s very good at building the strength that helps you maintain good posture as you fatigue on the run. Start on your belly, forehead to stacked palms. Lift and lower one leg at a time. Inhale to lift, exhale to lower. Lift and lower one leg and your upper body. Keep your head on your hands so you don’t hyperextend your neck. Extend your arms and lift and lower opposite arms and legs. Add a side bend to work your obliques: from a raised position, slide your torso to the right for several breaths, then to the left for several more. This is such a doozy—and so important for runners. The work in bridge strengthens the glutes and hamstrings, which power your stride. Start in a shoulder bridge. Lift one leg. Inhale to hold your knees parallel; exhale and kick your foot toward the ceiling. Lift one leg and draw circles in both directions. Lift one leg and lean it a few inches wide, then a few inches across your body. This is more spinal extension work. As opposed to locust, in which we articulate the spine into a backbend, bird dog challenges us to hold stable while the arms and legs move contralaterally. This imitates the running stride. From hands and knees, inhale to extend opposite arm and leg; exhale to lower them. Switch from side to side. Hold extended; draw circles with your raised leg while holding your torso and pelvis quiet. Hold extended; inhale to move your opposite arm and leg wide into a half X position; exhale to return to bird dog. We challenged shoulder stability, the obliques, and the hip rotators, including gluteus medius, in this sequence. Lift and lower to a side plank on the forearm and stacked knees. For more challenge, hold several breaths with your top leg raised. Balance on the bottom-side hip and lift your legs and top-side arm for several breaths. From your side, knees bent, inner edges of the feet touching, raise and lower your top knee. Raise and lower your top foot. Raise and lower both feet. With the feet raised, raise and lower your top knee. With the feet raised and top leg lifted, add a Spider-Man kick of the top leg before cascading back down. At the bottom of each round, repeat one basic clamshell. We ran out of time, so we didn’t do the rotation sequence I’d planned. It was boat pose (V sit) with rotation to challenge the obliques more. Definitely add some twisting exercises when you practice at home! Along with dozens of other short videos and full-length classes with me, this is available to stream at YogaVibes. Use the code sagefreemonth to extend your free trial to a month! This sequence is a nice way to wind-down and target runner’s tight areas: the chest, the deep hip rotators, and the hip flexors. Start on one hip, knees and ankles lightly stacked. Lower your chest toward the floor for a belly-down twist. Take your legs into a pinwheel shape and fold over the front knee to stretch the glutes and piriformis. Read more at Yoga Journal. With your legs still in the pinwheel shape, lift your hips to stretch the hip flexors and arch into a backbend. Finally, here’s a link I mentioned in the Sunday morning session vis-à-vis a discussion on association and dissociation. This study shows that both are valid mental tools that can enhance performance—it depends on the athlete. Thanks, everyone, for your cheerful attention. I hope to see you next time!